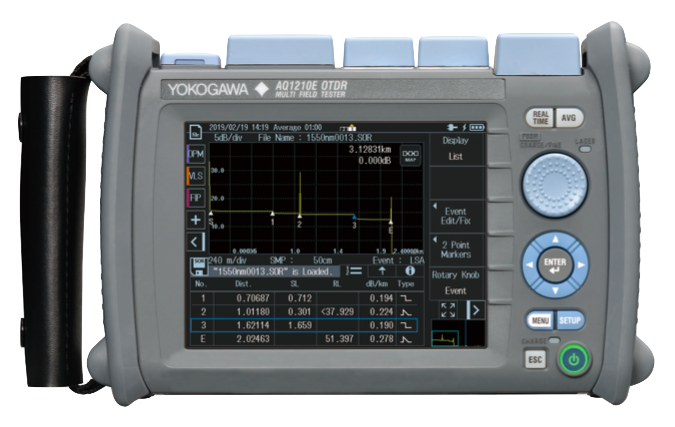 Yokogawa Test & Measurement Corporation announces the February 27 release of the AQ1210 optical time domain reflectometer (OTDR), a successor to the AQ1200 OTDR that has been enhanced with the addition of touch screen functionality and a larger-capacity battery. The AQ1210 OTDR is a compact instrument that is well suited for handheld use in the field, and it can be used not only as an OTDR but also as a power meter or light source. As such, the AQ1210 OTDR is ideal for use in the installation and maintenance of fiber-optic cables. With the growing use of the Internet, smartphones, digital terrestrial TV, and other technologies and the anticipated rollout of 5G networks, there is a great demand for instruments such as OTDRs that can support the installation and maintenance of the fiber-optic networks needed for the high-speed transmission of large volumes of data. To help meet this need, Yokogawa has developed the AQ1210, a compact and easy to use OTDR with excellent operability, functions, and performance. The AQ1210 is equipped with a 5.7-inch capacitive touch screen that offers excellent operability. It also comes with hard keys and a rotary dial that makes it easy to mark and shift OTDR waveform observation points. The AQ1210 has a large-capacity lithium-ion battery that delivers up to 10 hours of run time, enabling engineers to work a whole workday in locations where AC power sources are not readily available. The AQ1210 OTDR can automatically characterize the fiber in passive optical networks (PON) that use high-port count optical splitters. A built-in smart mapper enables the operator to rapidly characterize fiber and generate easy-to-read reports with icons clearly highlighting events. A Wi-Fi or Ethernet dongle can be plugged into the USB port to enable remote file transfer and control. * For all models, functions as an optical power meter, visible light source, and automatic check of optical fiber end faces are available as options. • Characterizing losses and identifying failure locations in fiber-optic cables, etc. Founded in 1915, Yokogawa engages in broad-ranging activities in the areas of measurement, control, and information. The industrial automation business provides vital products, services, and solutions to a diverse range of process industries including oil, chemicals, natural gas, power, iron and steel, and pulp and paper. With the life innovation business, the company aims to radically improve productivity across the pharmaceutical and food industry value chains. The test & measurement, aviation, and other businesses continue to provide essential instruments and equipment with industry-leading precision and reliability. Yokogawa co-innovates with its customers through a global network of 113 companies spanning 61 countries, generating US$3.8 billion in sales in FY2017. For more information, please visit www.yokogawa.com/. The names of corporations, organizations, products, services and logos herein are either registered trademarks or trademarks of Yokogawa Test & Measurement Corporation or their respective holders. The AQ1210 OTDR delivers high reliability, innovative technology, and enhanced operability.